The table above (click to enlarge) shows mean test scores and standard deviations for the SAT exam on the three different sections (reading, math and writing), broken down by gender (data available here, see Table 2) for the more than 1.5 million college-bound seniors who took the SAT in 2008. Difference-of-means tests that I have calculated (not reported here) reveal that the mean male test scores are significantly higher than the mean female test scores for both reading and mathematics (at the 1% level of significance), and the mean female test scores for writing are significantly higher than male test scores (at the 1% level). Confirming the results of previous research, additional statistical tests confirm that the variability of male test scores is significantly greater than the variability of female test scores, for both the mathematics and reading exams. 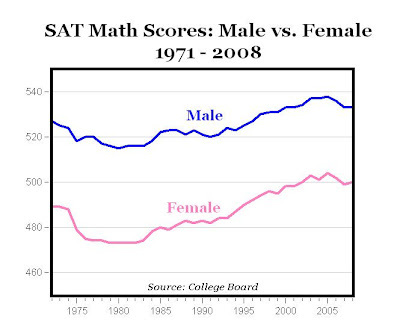 For math test scores above 750, males outnumber females by almost 2 to 1, and for test scores between 700-740, the ratio is about 1.6 males for every female. For the 650-690 range, males outnumber females by a factor of 1.38 to 1, and for the 600-640 range the ratio is 1:15 males to every female. For all of the other ranges except the bottom one, females outnumber males. 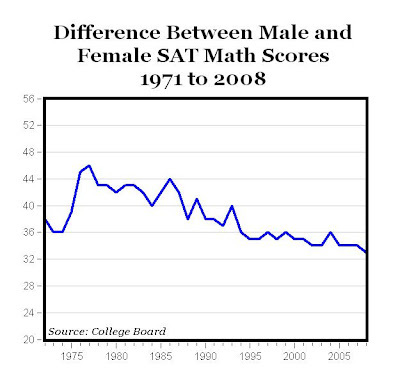 Overall, female SAT test takers (812,764) outnumbered males (704,226) by 1.15 to 1. The difference between male and female test scores for the math section of the SAT has persisted over time, see chart below (data here, page 3). Although the gap between male and female test scores has declined over time, and in 2008 was the smallest (33 points) since 1971 (see chart below). However, given the large sample size, even a difference in mean test scores of one point would still be statistically significant, so the gap would almost have to completely disappear before the average male and female scores would be statistically equivalent. Wasn't the entire point of the 2400-scale SAT to allow girls to offset their relative deficiency in math and reading by adding a writing section that would offset it? They couldn't design a test that kneecapped the boys without the gross bias being obvious, so they just added another section instead. Canadian Oil Sands: More Oil Than Saudi Arabia?